A beer I bought in in an asian shop in York, I only went in for to buy a particular dark soy sauce I like. 4.5% gold colour with a poor head, sweet malt aroma, sweet slightly malt fizzy taste. Pretty poor but it was refreshing. 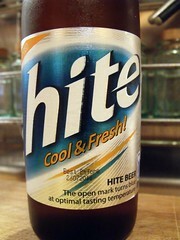 There have been some suggestions that the "S" has gone missing from the "Hite".